Several of my colleagues recently returned from a Middle School conference where they were inspired by teachers and guest speakers to think more creatively about their use of IT. This has resulted in a noticable uptick in interest in some of the things I have been sharing at school. I am excited that many of the ideas that I have been struggling to bring to the proverbial table are suddenly on everyone’s mind. Many of the questions involve “free” things that were waved tantalizingly in front of conference attendees, leaving them starry-eyed and optimistic about our students learning and their own teaching. I think OSED.org is a perfect place to respond to some of these inquiries with an honest assessment and some thoughts about freedom and openness. I went to the Jing website and downloaded the Jing desktop application and dropped it into my Applications folder after reading all 2405 words of the Software License Agreement. The Jing SLA is very clear that this individual copy of Jing is licensed to one user and that one user may not share Jing with other users. Jing comes in a “vanilla” and a “Pro” version, placing Jing firmly in the “free sample” column. The Jing website is peppered with ads for Jing Pro…and so are all video clips made with vanilla Jing! 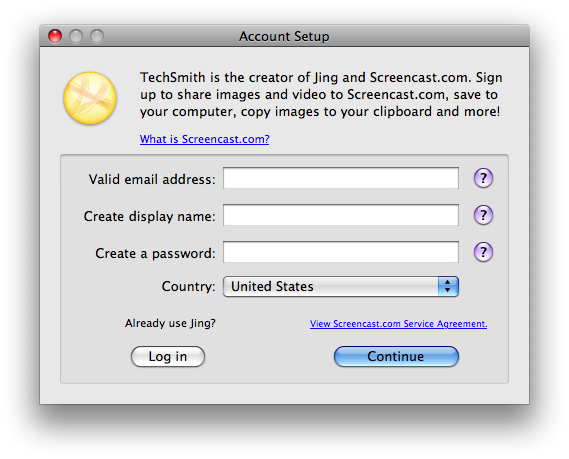 When opening Jing for the first time, I was prompted immediately to create a user account…starting with my own “valid email address.” Not one to give up my email address lightly, I read the 2227 words of the Screencast user agreement to see what the good people at TechSmith might want to do with my email address. Although they assure me that they will not send spam, they will be sending me offers for related products. Last time I checked, that is pretty much the standard definition of spam. The surrender of a working email address is required to use Jing and one account cannot be shared among multiple computers. Jing works as advertised, creating screenshots and motion captures with ease. Screenshots can be marked up with tools similar to the Crop and Annotate tools in Apple’s Preview. Motion captures are saved as .swf files and contain both a “splash” for Jing and also a live link to purchase Jing Pro, which contains additional features not available in vanilla Jing. Beyond the simple Preferences choices, Jing is not customizabe or extensible, nor is it interoperable with any other software. Freedom: Jing software, Jing captures, and the Jing support website are peppered with ads for Jing Pro licenses (misleadingly refered to as “buying”). These additional features cost money. Privacy: Using Jing requires not one but two restrictive service agreements and the disclosure of a working email address. Openness: Jing files are created in formats that are editable and viewable with other tools, but the software itself is not extensible or customizable. Control: TechSmith owns the software, the development process, and the means of distribution. Although Jing may be a fine piece of software, it fails to meet any of the four criteria: Freedom, Openness, Privacy, and Control. Jing is not free.